Note: This is a special edition of my usual monthly blog. Part II of the Vessel Preparation blog will be released on time, at the end of January. 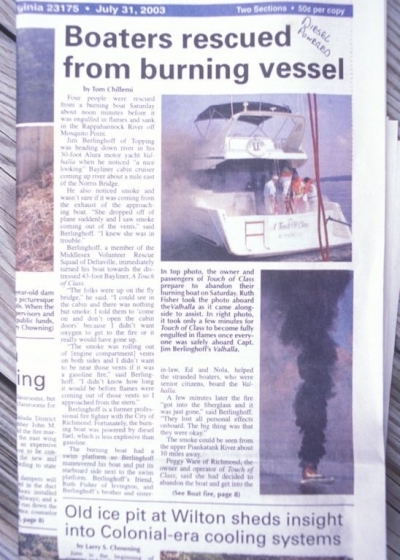 I'm writing this now because boat fires, as you will see below, have been in the news recently, resulting in injuries, severe damage and total vessel losses. Fortunately, there was no loss of life, this time. If you have not done so already, I recommend that you take these low cost actions. They will reduce the likelihood that you, your family and friends will ever be placed in harm's way by an onboard fire. These actions will also increase the likelihood that a fire aboard an unoccupied vessel will be noticed and hopefully extinguished before it, and vessels around it, are lost. Thanks to ample sources of fuel and often a breeze, the rapidity with which marine fires spread can be breathtaking, and in many cases, fires that start aboard one vessel quickly move on to others. This vessel was severely damaged in a covered marina fire not far from my home. It was one of the lucky ones as it was later repaired. Within the last week I've read about several serious vessel fires, one in Thailand aboard a 62-foot trawler and another in Coconut Grove, Florida, which started aboard a 65-foot motor yacht and then spread to three nearby vessels, at least one of which is a total loss. In the first instance, the vessel was unattended. Sadly, however, this well equipped, capable off shore passage maker burned to the waterline. 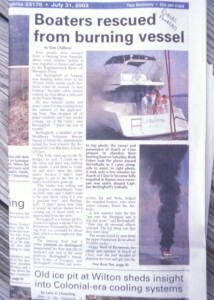 In the Coconut Grove event, a family of four was aboard the vessel where the fire started, two of whom were injured. Yet another fire occurred at a marina storage building in Canada. No one was injured, but scores of vessels were lost. While tragic, this trio of fires serves as a good opportunity to discuss fire protection and it's why I've decided to release this special blog on the subject. 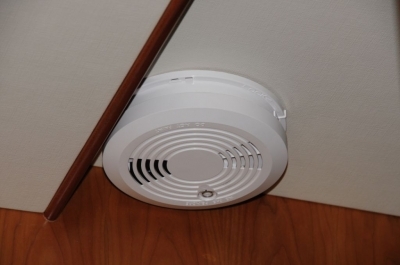 Why are smoke detectors so rarely found aboard cruising vessels? Reliable smoke detector technology has been around for decades. 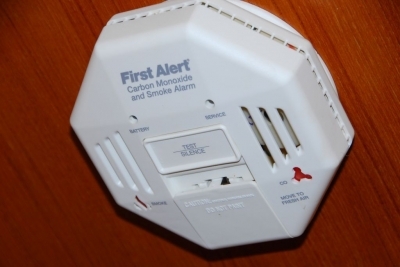 Much like their subsequently released carbon monoxide detector brethren, early smoke detectors went through a growing pain phase where false alarms were so frequent users tended to disable or remove them. Fortunately, those issues were soon resolved and today, for less than it costs to fill up a Prius, you can enjoy the protection of a smoke detector. Putting it in plain terms, you'd be foolish to pass up this invaluable and inexpensive protection for yourself, your family or guests as they travel, spend time and sleep aboard your vessel. Yet, mysteriously, they are so very rarely installed by boat builders and owners. Recently, while meeting with a dealer involved in the commissioning of a clients new vessel, I provided direction regarding installation of smoke detectors. I requested that seven units be installed (locations are provided below). The dealer's eyebrows shot up, "seven?!" he exclaimed, "why so many?" When I explained my reasoning and then asked why he was so reluctant to install them he responded, "They are so ugly". 'Indeed', I thought, 'as are third degree burns and body bags'. This is another local case, a tragic one to be sure, and one I think about often. 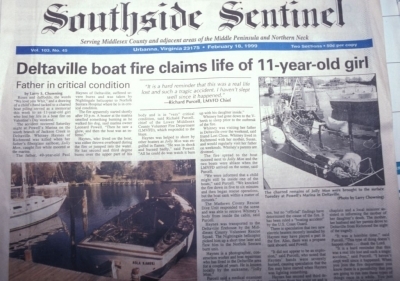 Ultimately, this fire claimed the life of the young girl and her father. The suspected cause, an electric space heater and faulty wiring. Could it have been prevented by a smoke detector? I believe the answer is, "yes." 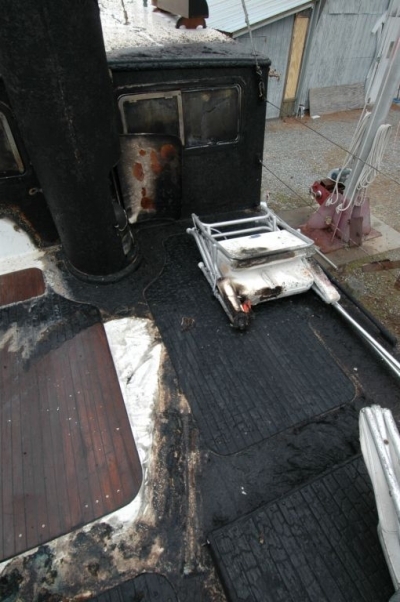 The value of the protection a smoke detector provides is self evident, smoke nearly always precedes fire and aboard a cruising vessel fire, along with flooding, is easily classified as among the worst of worst case scenarios. Early detection is the key to avoiding disaster in both cases; however, the consequences are certainly more dire where smoke and fire are concerned. If your vessel goes down, you can don a life jacket and, hopefully, crawl into a life raft. Few vessels, however, are equipped with fire retardant suits or breathing apparatus. Smoke detectors therefore become the first and possibly most important line of defense in dealing with the dangers of flame as well as the toxic smoke the fire is almost certain to cause when modern boat building materials burn. Interestingly, it's also likely to be the least expensive. Once a fire takes hold, fire extinguishers, both portable and fixed become the next option, one that you'll want to avoid at all costs. Virtually every fire extinguisher, even the smallest economy models, costs more than most smoke detectors. You get the point, smoke detectors are cheap insurance. 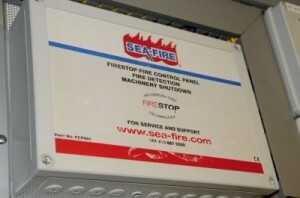 Central station smoke and heat alarms (this one also shuts down engines, generators and ventilation systems in the event the engine room fixed fire extinguisher is discharged) are valuable indeed, and ideally suited to new builds. As previously mentioned, an investment in smoke detectors for your vessel is very likely to be a small one. Fixed, hard wired, central-station type smoke, flame and heat detector systems for cruising vessels are of course more costly. They do, however, afford greater protection, notification and versatility. The fact is, with a few caveats, battery-powered, self-contained household smoke detectors are a viable and much less expensive alternative. Most have a useful life of between eight and ten years. Higher quality units alert you when this ten year time line is nearing its end, referred to as an "end of life warning". For marine use, I'd recommend a 50% safety margin and enact replacement on a five-year cycle. Again, for the cost of the units, this is still the cheapest smoke detection and fire safety insurance you can buy. Several domestic units have highly desirable features that simply cry out for use aboard a cruising vessel. Combination internal battery-powered smoke and carbon monoxide alarms are inexpensive and readily available at home improvement stores and on line. There are a few caveats for their use aboard, however. Two such units, offered by Kidde http://www.kiddewireless.com/Kidde%20Safety%20-%20Wireless%20Smoke%20Alarm.htm 1 and First Alert http://www.firstalert.com/detectors/battery/onelink-battery/sa511cn2-3st utilize wireless, RF technology to trigger every smoke alarm installed aboard your boat. Therefore, if the engine room-installed unit senses smoke, it sounds the alarm in units installed throughout the vessel, in the pilot house, saloon and berthing areas. Because the majority of fires that occur aboard recreational boats are electrical in origin, installing smoke alarms behind electrical panels, in lazarettes and over battery banks also makes good sense. I've installed and recommended RF wireless units for several years now and know of at least three occasions where the system alerted users to an impending fire long before it would have otherwise been noticed or became critical. A closed door can negate the effectiveness of a smoke alarm. Thus, for the cost, smoke alarms should be placed throughout your vessel, including on both sides of every door. Whichever units you choose, be sure to install one on both sides of every door in all berthing areas. That is, in the passageway outside a cabin door as well as inside the cabin. With this approach it becomes unlikely that a closed door could prevent an alarm from sensing smoke and sounding the alarm. One unit outside, but in a sheltered area, under hard top for instance. This will sound the alarm for your slip or anchored neighbors or marina personnel, whether the vessel is occupied or not, it will help if others know there's a fire aboard. Folks who experience onboard fires nearly always make the same comment, "It spread so quickly." Time is the key factor in fire prevention and detection; catching a potential confligration in the 'smoldering phase' is the goal. Smoke detector technology, ionization or photoelectric, how does it work and which is best? Photoelectric detection works very differently, however, it's also very simple, a light source within the detector is aimed away from a light sensor. When smoke enters the chamber it reflects the light onto the sensor, which triggers the alarm. Photoelectric smoke detection is more sensitive to smoky, smoldering fires. The US testing firm and publication “Consumer Reports” recommends that both technologies be used in the ideal, single detector. That may be a tall order to get that and all the features you want. If you must choose one, therefore, photoelectric is preferred as it's more sensitive to the more common type of fire, especially aboard a boat. The chosen detector should also carry a UL217 approval. The Coast Guard requires that smoke detectors/alarms be installed in the sleeping compartments of inspected vessels (those carrying paying passengers). Under CG guidelines, the smoke detector should meet Underwriters Laboratories standard 217. The National Fire Protection Association also calls for adherence to UL 217 in vessels over 26' (10.7m). For years I've advocated the installation of proprietary marine, hard-wired carbon monoxide detectors over battery-powered household units. The reason for this recommendation is twofold. First, using a function called time weighted averaging, units designed for installation aboard boats are designed to avoid nuisance alarms caused by momentary exposure to CO. It's a truism, anything that sounds regular false alarms is soon to be ignored, and so, avoiding this scenario is important. 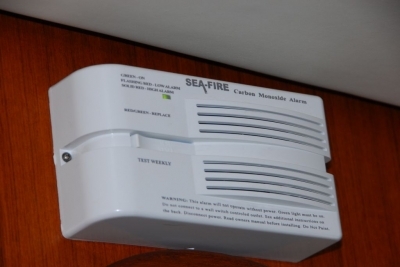 Second, because these CO detectors operate from the vessel's own battery banks, you are assured that they will be functional whenever the vessel is operational (if the boat's batteries are dead, it's unlikely you'll be staying aboard for very long) and there's no danger of an internal, 9-volt battery going dead. 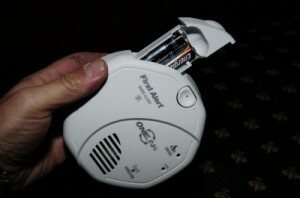 Stand-alone carbon monoxide detectors that are powered from the vessel's own DC system, like the one shown here, are equally as important and necessary as smoke detectors. Internal battery-powered units are just as effective, however, users must remember to replace batteries religiously. Unfortunately, other than in the aforementioned central station or in 120-volt AC versions, hard-wired smoke alarms in the CO alarm style described above and designed for marine or RV applications are not readily available. (120-VAC hard wired/9-volt internal battery/RF versions such as the model shown herehttp://www.firstalertstore.com/store/catalog.asp?item=1235 are well suited to larger vessels whose AC systems are continuously energized). Thus, we are forced, for the time being, to use the internally-powered 9-volt variety. No big deal, you might say, that's how the household units are set up. They sound that impossible-to-ignore annoying chirp (the one in my bedroom always seems to begin sounding at 2AM) for weeks when the battery begins to fail, which works just fine. However, most homeowners don't vacate their homes for months at a time and if the battery happens to go dead while you aren't aboard for one of those extended periods, it's possible you'll return to a non-functioning alarm. This smoke alarm is capable of communicating with, and setting off other units like it throughout the vessel. The value of this type of alarm cannot be over-estimated. For the cost, it's very likely the cheapest insurance you will ever buy. Therefore, until smoke alarms are offered that operate from the vessel's own DC power, it's critically important that you test monthly and replace batteries annually for all smoke detectors aboard. There's simply no good reason to forgo the installation of smoke alarms aboard your boat, my strong recommendation is that you avoid spending even one more night aboard without this vital protection. 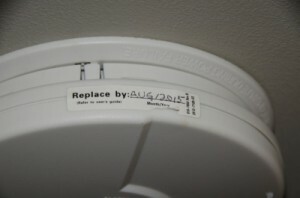 The lifespan of a smoke detector itself is finite. Most manufacturers specify replacement every ten years and some even sound an 'end of life signal'. For marine use, a conservative replacement schedule is every five years.